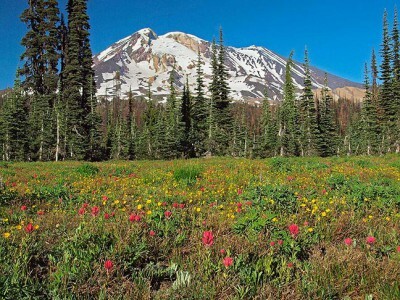 The Bird Creek Meadows—largely within the Yakama Nation Mount Adams Recreation Area—is one of the most treasured subalpine parklands in the Cascades. 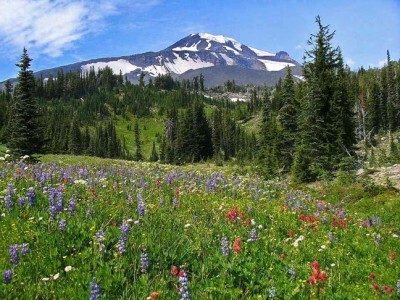 Its spectacular wildflower displays are well-known to botanists and nature lovers across the country. The Native Plant Society lists 162 plant species, including 10 conifers. On the mountain’s southern slope, over 100 glades and meadows form a triangular area between 5,700 feet and 7,100 feet. 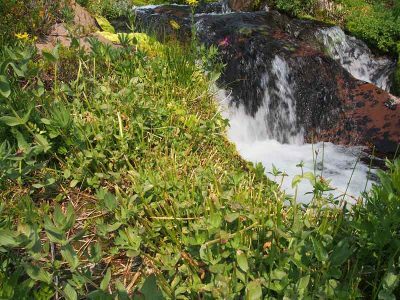 Tumbling down through the beautiful meadows are about a dozen spring-fed streams, most of which flow into Bird Creek. 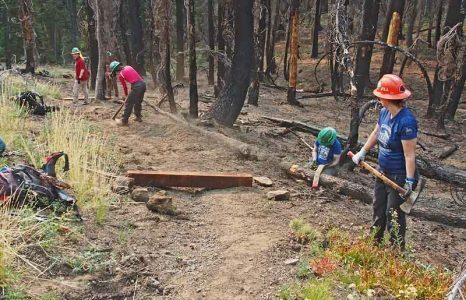 WTA volunteers did a wonderful job of repairing and improving the Bird Lake Tr., Bluff Lake Tr., Round-the-Mountain Tr. and Trail of the Flowers. (1) The Bird Creek road (Rd. 285) to Bird Lake is in, by far, the worst condition we’ve ever seen it. The road is very nearly impassable. (2) The Yakama Nation drift fence was in disrepair. Only part of it had been put up as of September 3rd. 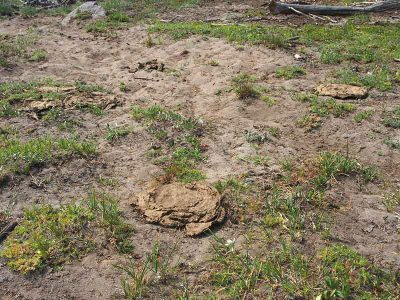 However, cattle have been passing through it freely all summer—as they did during the 2016 grazing season. 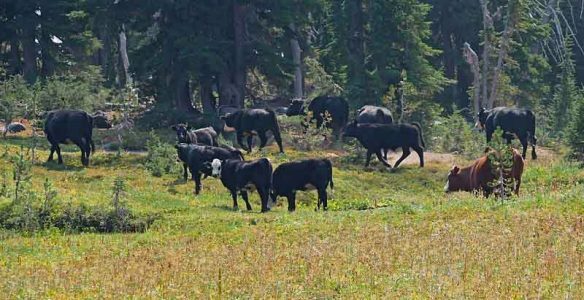 We counted at least 17 trespassing cows, yearling calves and a large bull in two different parts of the meadows. Most of the cattle were seen along Crooked Creek above the falls. 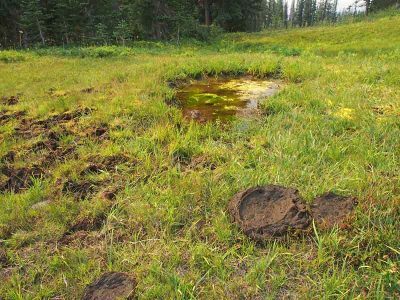 Evidence clearly shows that cattle have grazed heavily throughout the Bird Creek Meadows for the past two years. Parts of the meadows look and smell like beaten-down cow pastures. 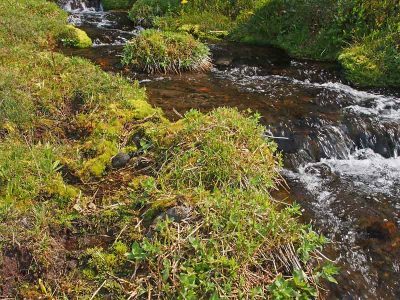 Riparian areas are being trampled and severely impacted in a number of ways. For example, along streams nearly every clump of late-blooming Lewis’ monkeyflower has been eaten. 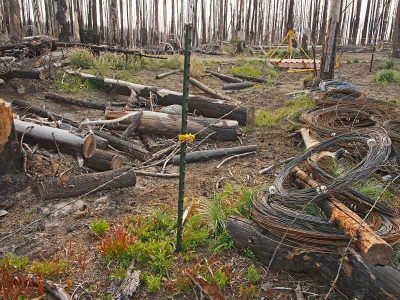 Plant processes important for survival will undoubtedly be affected, because very few blooms or seed pods remained. We immediately called and reported the trespass to the owner of the cattle, Neil Kayser family of Centerville, Washington. They refuse to chase out their cattle until the Yakama Nation puts up their fence properly. 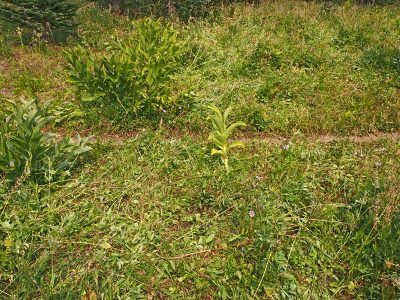 The Bird Creek Meadows parklands are being severely degraded from repeated, illegal grazing. For the last two years the Yakama Nation has failed to keep them cattle-free. Featuring: Three beautiful all-day hikes on Mt. Adams: two on the southeast side and one on the southwest side, ranging from “moderate” to “strenuous”, led by 6 knowledgeable FOMA board members. Plenty of time for wildflower viewing/identification, photography, interpretation of the natural and cultural environment, climate warming impacts, stories of the colorful history, and getting to know new friends. Only 12 persons max. per group. Bird Creek Meadows Loop (Moderate: about 6 mi. r.t., less than 1000 feet elevation gain/loss, all on trails within the Yakama Nation Mt. Adams Recreation Area. Starting at Bird Lake (el. 5,585 ft.) on the mountain’s SE side, hike the Crooked Creek Falls Trail, Trail #9 through the famous meadows (av. elev. 6,140 ft) ; take a small loop up to Hellroaring Ridge for spectacular views (about 6440 ft.); then back to the B.C. Meadows picnic area, returning to Bird Lake via the Bluff Lake Trail. 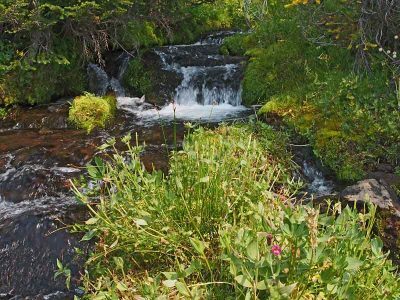 Highlights: flower-lined streams and subalpine meadows, waterfalls and lakes; variety of birds; views of Mazama Glacier, Hellroaring valley, Glenwood Valley and Columbia Hills in the distance. Leaders: Jurgen Hess, (hess@gorge.net , 541-645-0720, assisted by Bill Weiler. Horseshoe Meadow (Moderately strenuous: about 8 mi. 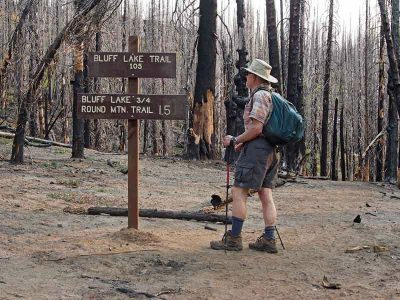 r.t., 1,800 ft. elevation gain/loss on the mountain’s SW side, all on trails within the Gifford Pinchot National Forest. Hike the Stagman Ridge Trail (t/h 4,193 ft.) entering the Mt. 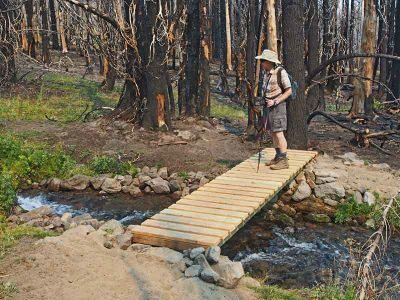 Adams Wilderness and gradually ascending through a partially burned forest with wildflowers, meadows, and a few small streams. 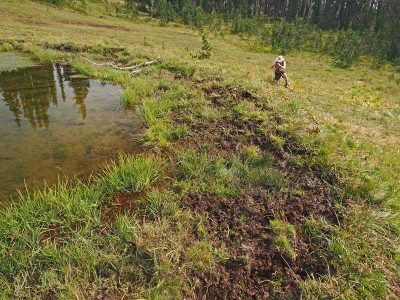 Join the Pacific Crest Trail at 5,800 ft., and continue into lovely Horseshoe Meadows (5,920 ft.). Optional short off-trail loop above the meadows. 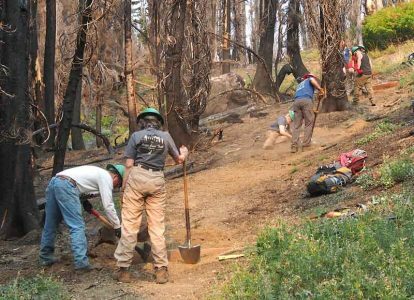 Highlights: recovering vegetation from the 2012 Cascade Creek Burn, wonderful views of the valleys, Mt. Hood, Indian Heaven, Mt. St. Helens, and Mt. Adams’ rugged SW face; wildflowers, meadows, streams, and birds. Leaders: Darvel Lloyd (darvlloyd@gmail.com) , 503-251-2784, assisted by Cheryl Mack. Ridge of Wonders Loop (Strenuous, mostly off-trail: about 8 mi. r.t., 2,100 ft. elevation gain/loss, in Yakama Nation Mt. Adams Recreation Area. 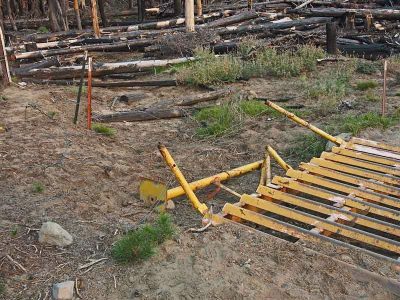 Start at Bench Lake (4,920 ft.), drop to 4,760 ft., and take an old trail to Island Spring Camp at 5,320 ft. Then ascend off-trail to a spectacular viewpoint on the Ridge of Wonders (6,830 ft.). Descend to a saddle, then optional climb of Little Mt. Adams cinder-spatter cone (6,800 ft., 360 ft. vertical). Return by way of Hellroaring Meadow and Heart Lake. Probable wading of marshy area on return. Highlights: east-side vegetation, views of Klickitat Glacier cirque and Big Muddy canyon, possible mountain goats. Leaders: Darryl Lloyd (longshadow@gorge.net , 541-387-2217, assisted by Dean Myerson. Cost: Free of charge, except for a small voluntary contribution to the driver for gas, wear & tear. Options 1 and 3 require a $5.00/car day-use permit from the Yakama Tribe, collected at their Mirror L. entrance. Option 2 requires a NW Forest Pass or Golden Age “Passport” per car. Maps and all other details (meeting time and place) provided by Hike Leader. Please register with the leader of the hike you’d like to attend. Give names, email addresses and phone numbers (incl. cell numbers). 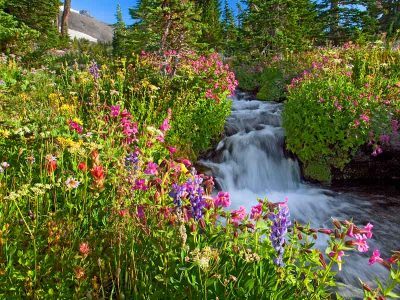 Many flower-filled meadows and glades, and a dozen crystal-clear streams make up the subalpine parkland of Bird Creek Meadows. The famous meadows form a mile-and-a-half-wide triangular area, beginning at 5,700 feet and ending at 7,100 feet below a towering moraine of Mazama Glacier. Horseshoe Meadow is an island in the 2012 Cascade Creek Burn on Mt. Adams’ southwest side. The rapidly receding White Salmon Glacier lies below The Pinnacle and summit cone, with Pikers Peak on the right. 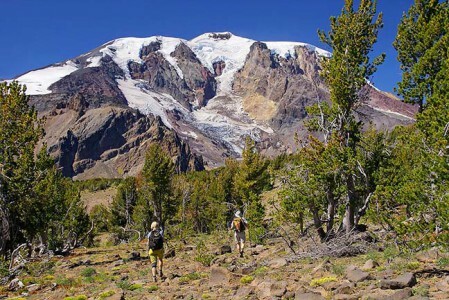 Hikers on the Ridge of Wonders head toward the Klickitat Glacier cirque — second largest active glacial cirque in the Cascade Range. From the north edge of the ridge, one can look a thousand feet down into Big Muddy canyon and across to Avalanche Valley on the east side. Above the hikers, the summit is about 3.5 miles away and 5,500 feet higher. If you are interested in applying, please contact is at info@mtadamsfriends.org. The Friends of Mount Adams organization has been officially granted federal Non-Profit 501(c)3 status, so all donations are now tax-deductible! Our tax ID number (EIN) is 27-0665753. 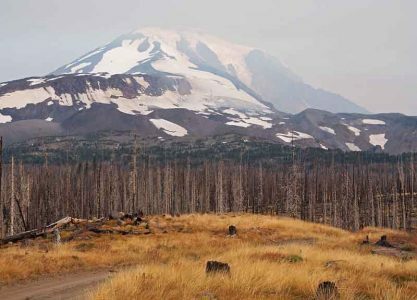 Become a Friend of Mount Adams and receive occasional news about events, action alerts, annual hikes, etc.